What do you get when you give the PlayStation 4 console on testing to the team from HITech Reports? Of course, the ultimate test! Why not be the first at something in the world? Do you know what it is? 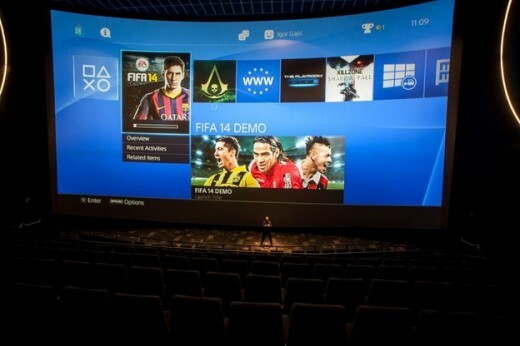 Playstation 4 tested on IMAX screen! The team decided to grab the Playstation 4 console in hand and run to the IMAX theater where is the screen diagonal of 30 meters. We took projection room, connected PS4, and then equip ourselves with lots of popcorn, so we had everything and we could start playing on 332 square meters of the screen. Once we were delighted to find that the DualShock 4 controller has no trouble collecting signals from the console across the hall, we took prime places in the cinema and went in angry clashes in the games Call of Duty: Ghosts, Assassin’s Creed IV: Black Flag and Killzone Shadow Fall. The experience of playing on the ultra large screen was unreal when the violent scenes of the new CoD began to unfold before our eyes, and during several hours of playing, popcorn in the heat of battle flew across the hall.